January's issue of Bon Appetite Magazine revolves to a large degree around "value - with delicious taste, of course" and they seem to be hopping on a fairly predictable trend, given the state of things these days. Value does not, it seems, mean opening a series of cans and dumping their contents into a casserole, or, worse, settling for fast food and sacrificing your body on the alter of affordability. 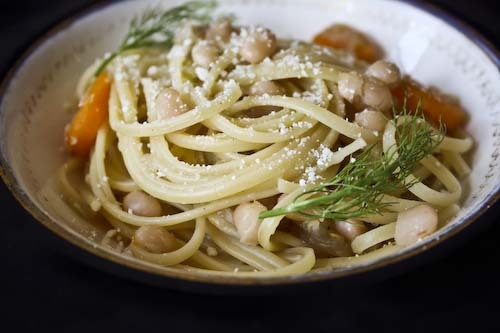 Although not universally the case, when I see a pasta dish, I think inexpensive, same goes with a dish built around beans, especially the dried kind. But have you ever put the two together? I had not, at least, not until tonight. I must admit that while thumbing through my copy of Johanne Killeen and George Germon's Cucina Simpatica, concocting the most inexpensive dish possible was not my goal. Using beans a bit more, however, has been at the back of my mind for a while. Admittedly, I didn't expect to find many bean recipes in a cookbook dedicated to the self-proclaimed "robust trattoria cooking" of Al Forno, the famed restaurant from Providence, Rhode Island. So when I saw Linguine with Cabbage and Butter Beans I was interested, if not arrested. Cabbage and butter beans over pasta? Was this taking the eating cheap edict a little too far? The answer, in a word, is no. Although Killeen and Germon dress the dish up with 4 tablespoons of olive oil and an entire stick of butter (!! ), I decided to dial it down a notch and use just a bit of oil for sautéing the veggies and no butter at the end (my version is what you find below). While not restaurant quality in the rich and heavy way we sometimes expect, it was a somehow more honest supper: humble ingredients combining to become something more than the sum of their parts, without the crutch of that added decadence. The cabbage dissolved into a silky base for the liquid sauce, enveloping beans and pasta with a flavor much more subtle than raw cabbage suggests. Carrots add color and a bit of sweetness, while the butter beans themselves completely satisfy. Not just tasty, it was downright addicting, and made me much more confident about my other pasta dish choice for the week: Spaghetti with Spicy Lentil Sauce. Who knew beans and pasta made such comfortable friends. Heat the oil in a pot and add the fennel, carrots, onion and garlic. Sauté on low-ish heat for about 30 minutes, until the vegetables are tender. Add the cabbage, red pepper and salt and continue to cook for another 10 minutes. Add the beans and 8 cups of water and bring to a boil. Lower the heat to a simmer and cook until the beans are soft. This could take anywhere between 1 to 1 1/2 hours. Add additional salt if needed. In the meantime, cook the pasta in boiling water for about 4 - 6 minutes, just before al dente. Drain and add to the sauce. 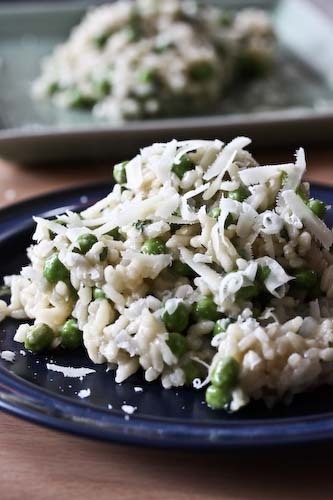 Toss the pasta and the vegetables together for 2 minutes and serve with a grating of cheese. Update: thanks to a commenter for pointing out an error. I didn't have butter beans on hand, which is what the recipe calls for, and substituted navy beans instead, but forgot to switch it in the write-up. Thanks for noticing! "sacrificing your body on the alter of affordability"...i like that line!! I've never seen cabbage and beans with pasta before. But I have seen pureed beans used as a pasta sauce. This is a great meal during times when everything is expensive except pasta (and gas, surprisingly!). Killeen and Germon are the best. I should really get to Providence one of these days. 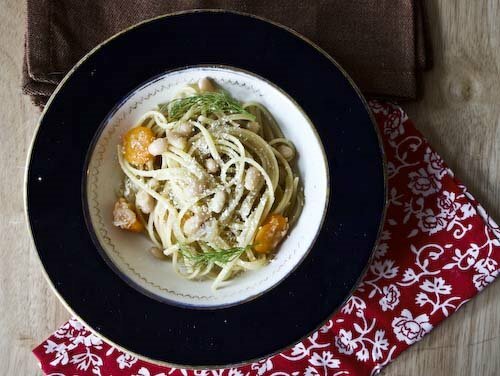 Your linguine looks amazing! Those don't look at all what I know as butter beans in Texas. More like small white beans or navy beans. But it does look righteous! Another fine similiar comfort dish is Polish in origin I think. Forgive my spelling Haluski. cabbage, egg noodles, and bacon. All good. Veggie Belly, that's true, I hadn't thought of a pureed bean pasta sauce, but it sounds familiar. Better than pouring gas over your pasta! Lisa, I've never been to the restaurant (or to Providence for that matter), but this was pretty good! Anonymous, you're right, thanks for the catch. I substituted navy beans for the butter beans and have updated the post accordingly. I'll have to look into Haluski. I'm starting to dig this beans and pasta business! I do this kind of thing a lot too. It starts to become addictive; the ease and flavour benefits of keeping it simple are awesome. My husband thinks he doesn't like cabbage although he loves sauerkraut and coleslaw. I'm going to have to test him with this! Mr. Beagle would LOVE this one! gkbloodsugar, I couldn't agree more. Less expensive and healthful, too! Dana, I understand not liking cabbage, but I love it! You don't really taste it in this, though. Miss Marie, if you try it out, let me know how it goes! foodphotoblog, I wouldn't have either, but it worked! Super success. Added a little bit of butter to the linguine before adding the rest, but far from a stick, and it was plenty. Loved this recipe. Thanks Andrea! I finally got this made today. Your recipe is spot on Yummy.